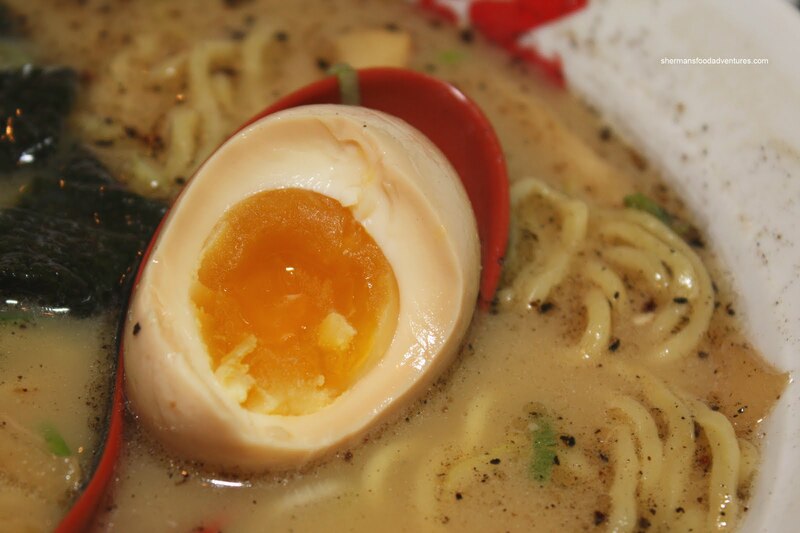 There has never been a time where Japanese ramen has been so accessible. Of course there was ramen available at many Japanese restaurants before; but let's be honest, none of them were really all that good. And don't even get started on instant ramen. That doesn't count. However, I practically grew up on Nissan noodles with a side of Spam and fried egg. Yum! That was before I discovered I'd be better off munching on a Quarter Pounder with Cheese if I were to take into account the nutritional information. I digress. Located in "ramen central" around Robson Street, Sanpachi is the newest kid on the block and replaces the forme r Royal Thai. 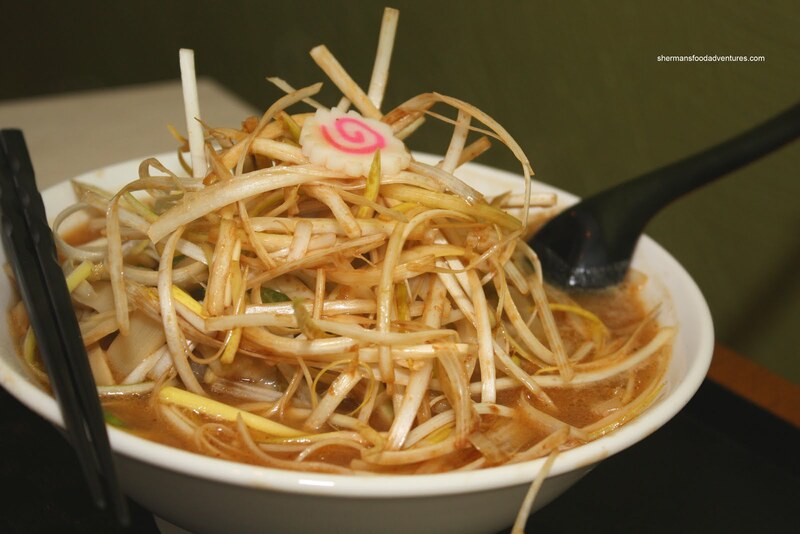 Much like Santouka, Sanpachi originates out of Japan and this particular location is its first in Canada. I was wanting to try the place out last Friday, so I called up Kim. Turns out he had already visited the place 3 times in one week! Luckily it is ramen, not something like... brains! So, a week later, I was able to recruit Krazi to join me for some Ramen. Much like the other ramen joints around, there are the usual choices such as shio, tonkotsu, shoyu and miso. 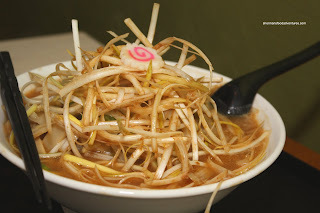 Seeing that, Krazi went for something a bit different in the Negi-Ramen in a miso broth. Topped with onions and leeks, there was a definite herbiness to the overall flavour profile. 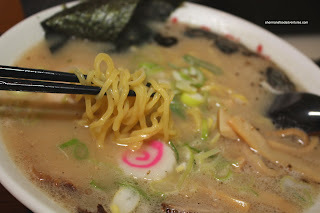 The ramen was still chewy despite sitting in the broth while I took photos. We thought the miso was a bit salty with some spiciness. Thin slices of chashu and bamboo shoots completed the dish. For myself I went for a combo which included a side of Nori-Mayo. 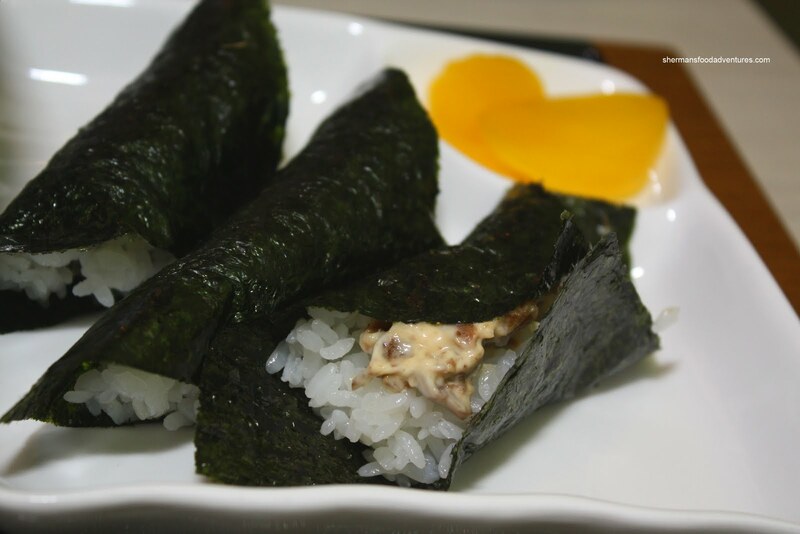 As the name suggests, there is both dried seaweed and mayo. It was essentially sushi rice with a mayo/pork mixture within a piece of nori. This was actually good, despite my initial reservations. I liked the chewy rice with the meaty pork and smooth mayo. A few slices of oshinko accented the dish. For the other part of the combo, I selected the Tonkotsu Ramen. The first thing I noticed was the dark oil drizzled on top. Upon further investigation, it turned out to be black garlic oil. It added a certain depth and bitterness to the already flavourful broth. I found the broth a bit salty; yet not disturbingly so. There was a definite rich pork taste which is a few notches below Santuoka in my opinion. Bamboo shoots, nori, chashu, green onions and a slice of fish cake rounded out the bowl. The chashu was good being soft and moist, too bad there wasn't enough of it. For my one extra, I added an Ajitama Egg (strangely named Yummy Egg on the menu). It was cooked properly with a runny centre. At first, I was concerned I wouldn't be full; but with the thicker noodles, I ended up quite satisfied. Definitely good flavours with proper execution. 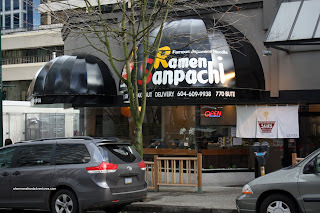 Sanpachi is a fine addition to the ramen corridor (aka Robson); yet it doesn't manage to unseat Santouka as my personal favourite. Thanks for the shout out! Having said that, I hope you don't mind me do a shameless plug in: here is my brains post!